Sew Festive Handmade: Irish Chain Top - Complete! I made a pact with myself this past weekend. I sewed during a great afternoon Florida thunderstorm with my favorite fluffy companions. I actually laid all the blocks out first on my bed. 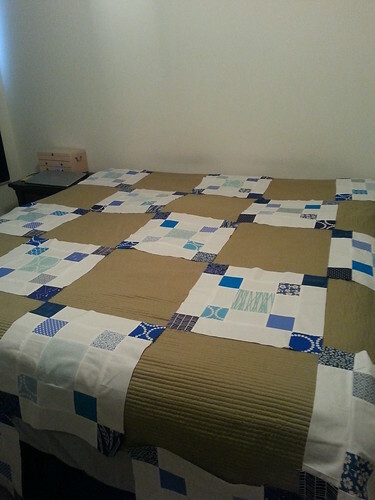 I figured a king-size bed was a convenient place to lay out blocks for a king-size quilt. I had a great layout that I loved, so I collected and numbered the rows, and set them aside to take a Project Runway break. And then as I was sitting there I had an epiphany. 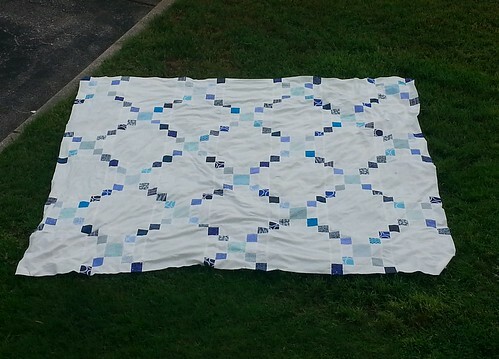 Typical quilt layouts have the shorter side as the width, and the length is the longer side. But king-size beds are wider than they are long. So my original layout of 6x7 would not work. I know, I know, most of you are thinking "oh, but you could just turn it sideways and be golden." But folks, I had one directional print. ONE. Darn you adorable Sarah Jane anchors! So I laid the quilt out again, and had juuuuust enough space in my living room. The overwhelming majority of the square corners line up beautifully, and I only got one block turned around when sewing. 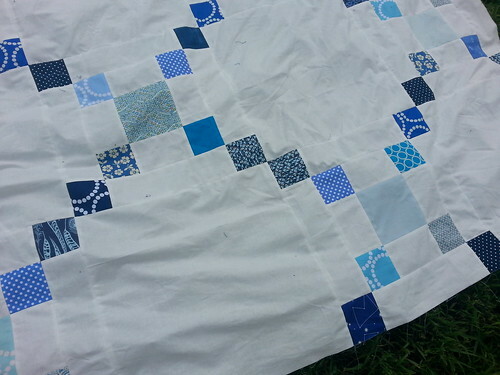 I haven't decided if I wanted to unpick that bit and flip the block or if I'll leave it as a reminder that I created this quilt in all its imperfections. I needed some help taking pictures of this monstrosity. 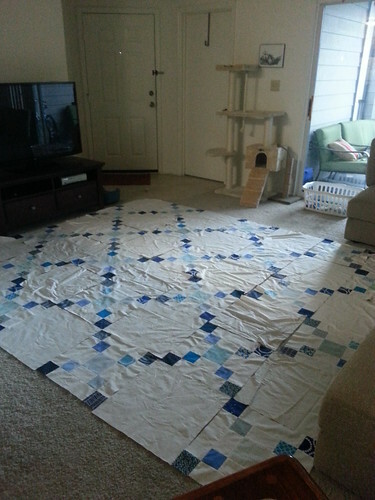 Each block finishes at 17", so it's no small feat to get it laid out flat and looking pretty. 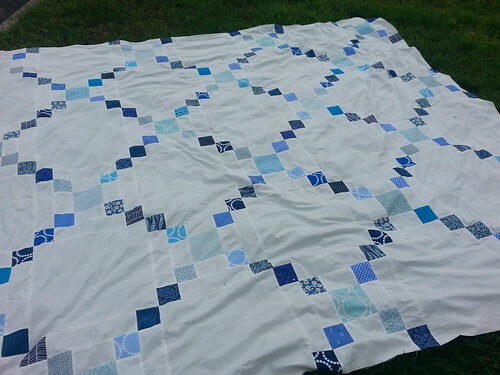 I hope to have this quilt on my bed by October, so I have a whole month to get it quilted and bound! Fingers crossed! 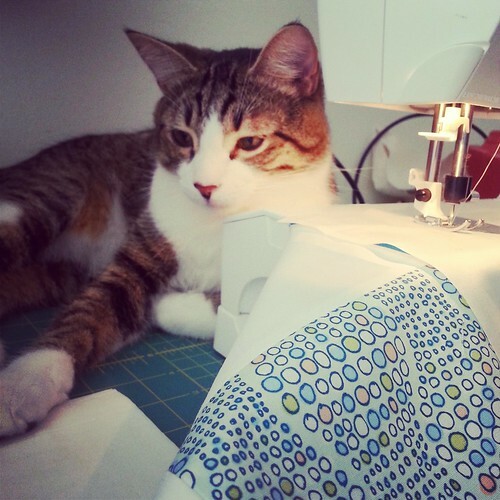 **Linked with Fabric Tuesday and WIP Wednesday! Woot! That's a huge accomplishment. 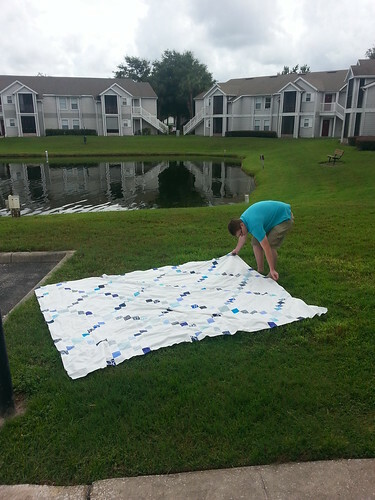 Did you decide how to quilt it? Looks fabulous. Can't wait to see it finished. Your pact was a great one! I'm glad that you were able to keep your pact. And your Irish chain looks great! I love Irish chains.